Acute opioid intoxication and overdose are common causes of presentation to emergency departments. Although naloxone, a pure opioid antagonist, has been available for many years, there is still confusion over the appropriate dose and route of administration. This article looks at the reasons for this uncertainty and undertakes a literature review from which a treatment algorithm is presented. Although naloxone has been used as a specific antidote for opioid poisoning since the 1960s,8 there are variations in the recommended doses with the British National Formulary advising 0.8–2 mg boluses, repeated as necessary up to 10 mg for adults (10 µg/kg followed by 100 µg/kg boluses for children), and Poisindex suggesting 0.4–2 mg boluses. There is also wide variation in the route of administration. Third, the pharmacodynamic actions of naloxone last for a briefer period than all but the most short acting opioids;8,24,29,31 although the elimination half life of naloxone is similar to that of morphine (60–90 minutes)9 it is redistributed away from the brain more rapidly.32 Consequently, the patients may become renarcotised and suffer harm if they self discharge from medical care early. Clinicians are clearly walking a tightrope between precipitating AWS and avoiding renarcotisation. Seizures52 and arrhythmias53–57 have also been noted, but could have been caused by hypoxia,54 the opioids themselves,44,55,58 their coingestants (most notably cocaine),57 or pre-existing disease.53,56 Interestingly, a number of episodes of severe hypertensive reactions have been reported following administration of naloxone to patients with pre-existing simple hypertension.59–63 In addition, one report showed a significant rise in serum catecholamine concentrations in a patient with a phaeochromocytoma following administration of naloxone without prior exposure to exogenous opioids.64 Currently, a great deal of research is being undertaken on the interaction of endogenous opioids and the autonomic nervous system and it would seem reasonable to postulate that the antagonistic action of naloxone may have an effect. Canine experiments have indicated that reducing hypoxia and hypercapnia lowers serum catecholamine concentrations. It has been proposed that hyperventilating patients prior to administration of naloxone would reduce the risk of sympathetic mediated adverse effects,58,65 although this has not been verified in human. The aim of this review is to find evidence of the optimum dose and route for administration of naloxone and for how long patients need to be observed before it is safe to discharge them. “naloxone or naloxone” and “narcotics or opioid or opiate” or “morphine or buprenorphine or codeine or dextromoramide or diphenoxylate or dipipanone or dextropropoxyphene or diamorphine or dihydrocodeine or alfentenil or fentanyl or remifentanil or meptazinol or methadone or nalbuphine or oxycodone or pentazocine or pethidine or phenazocine or tramadol” and “overdose” or “overdos$” or “poisons” or “poison$” or “acute intoxic$” or “acute toxic$” and limited to human studies. Studies were deemed to be relevant if they compared doses and routes of administration of naloxone or if they produced evidence about rates and timing of complications. Case histories were reviewed but were included only if they could be reasonably grouped together for comparison. All papers, including review articles and case histories, had their references scrutinised for further articles that were in turn retrieved and reviewed; this process was repeated until no further articles were found (a total of five rounds). The initial search produced 185 papers; the subsequent series of reference reviews produced 10 relevant articles.65,69–77 These papers are summarised in tables 1 and 2, which can be found on the electronic version of this article. AWS include agitation, nausea, vomiting, piloerection, diarrhoea, lacrimation, yawning, and rhinorrhoea; these are generally not life threatening.78 Reported rates of AWS related complications vary widely from 7–46% with 2–4 mg boluses70,72,73,76 to 47% with a median of 0.9 mg;71 however, the actual outcome measures were not directly comparable. Only one study records AWS (12%),72 with one US paper quoting the number of patients (7%) who required restraint (presumably the most severely affected patients)76 and the other studies describing the proportion of patients who discharged against medical advice (18–47%).70,71,73 Patients self discharge for many reasons—for example, fear of police involvement—so that the numbers who do abscond do not necessarily equate to those who experience AWS, although clearly they are no longer narcotised in order to be able to leave the emergency department. Another potential problem in interpreting the data is the lack of information comparing absolute doses given and rates of administration with AWS, and state of drug dependency/tolerance prior to AWS. Wanger’s study77 stated that the paramedics had the impression that patients who were given naloxone subcutaneously had a smoother emergence than those given it intravenously in spite of a larger dose. It is likely that this is because of a slower increase in concentrations at the receptors, but further research would be needed to confirm this; it may also reflect paramedics’ preference for an easier route of administration. Four papers quote the percentage of patients who require a second dose of naloxone,72,74,76,77 again with marked variation across the world and between centres in the same country. Watson’s72 and Sporer’s76 patients were given 2 mg boluses, and 14% and 35%, respectively, were given a second dose. In Christenson’s74 and Wanger’s77 studies, patients were given either 0.4 mg intravenously or 0.8 mg subcutaneously, with 55% overall having further naloxone in the former study compared with 15% (subcutaneously) and 35% (intravenously) in the latter paper. This marked variation may be explained by the studies having different thresholds for giving further doses of naloxone as opposed to treating the patients conservatively, as well as very different half lives of opioids taken—heroin versus methadone. Watson72 found that recurrence of toxicity was significantly more likely when long acting opioids were ingested, although route of opioid administration and use of coingestants surprisingly did not have any noticeable effect. Only two papers compared routes of administration.76,77 Both studies used different criteria to define opioid intoxication (in terms of history and clinical findings) and naloxone was given in the prehospital setting; therefore, it is difficult to generalise the findings to other patient populations. In spite of these concerns, Sporer76 showed that 2 mg naloxone intramuscularly works as well as 2 mg intravenously (94% and 90% response rates, respectively); this is perhaps not surprising considering the relatively large dose given and it was not possible to distinguish differences in complication rate between the study groups. Wanger’s study77 revealed that 0.8 mg naloxone subcutaneously worked as rapidly as 0.4 mg intravenously from time of arrival at the patient’s side to time of clinical effect, because the slower time of effect from administration was offset by not having to gain intravenous access first. Neither of these studies settles concerns about unpredictable and erratic absorption from the intramuscular/subcutaneous injection sites in those patients who are hypotensive, but they may be useful alternative routes when intravenous access is difficult to obtain. No studies have evaluated the absorption kinetics of intramuscular administration of naloxone. It is likely that variables—including depth of injection, dose given, muscle blood flow, site, and so forth—would all alter the kinetics of absorption by the intramuscular route, particularly in the opioid poisoned patient with hypotension. Recent case series and reports have suggested that both intranasal79,80 and nebulised81 naloxone may be effective, although they are subject to similar unanswered pharmacokinetic concerns. Also, there is no evidence about the rates of renarcotisation and AWS. Goldfrank’s study75 provides a good practical dosing guide for patients who require prolonged opioid antagonism. It was a small study where the end point measured plasma naloxone levels and not clinical effect; however, it claimed only to be an initial guide to treatment, and stressed the importance of close observation of the patient and titration of dose as necessary. This makes sense because of individual tolerance and susceptibility to opioids—for example, clinical observation has shown that corpulent patients will absorb opioids into fatty tissues from which it is expected to redistribute out more slowly and such patients tend to need more prolonged naloxone infusions. Further research is required to validate formally and prospectively the Goldfrank protocol. Christenson et al74 suggested that if patients fulfilled certain criteria 1 hour after administration of naloxone then they could be discharged safely. However, one of their patients who had taken heroin needed further naloxone after 2 hours and Watson et al72 similarly noted that patients who had taken long acting opioids developed renarcosis up to 2 hours after their initial treatment. Since the half life of naloxone is 60–90 minutes, it would seem logical to observe patients for signs of recurrent toxicity for at least 2 hours, although further studies are needed to validate this. Flowchart of treatment of opioid overdose. With one exception, all other serious complications became apparent within 20 minutes of arrival and treatment in the emergency department.65,70,71 The one exception was a case of fatal pulmonary oedema, where the patient was found dead 7 hours after discharge (9 hours after ingestion of opioid). In this case, further opioid ingestion cannot be ruled out, and in any case it would seem that genuinely delayed adverse events are rare. Because it would be difficult to persuade opioid addicts to stay for 8 hours after they have had naloxone, it would be reasonable to discharge them if they fulfil Christenson’s criteria 2 hours after naloxone. Legal, political, and ethical difficulties, particularly in the context of obtaining consent, often hinder the recruitment of adequate numbers of patients. In addition, trials would have to be prohibitively large to achieve sufficient power when measuring outcomes that are rare. It is difficult to eliminate confounding factors, such as the wide range of different opioids, co-ingestants, and adulterants that can be taken, the variety of routes by which they can be taken (orally, intravenously, subcutaneously, nasally, or by smoking), and the complex treatment regimes that are given. It is often difficult to determine what individual patients have taken because usually they do not know. The external validity of the studies can be questioned because many are undertaken in regional poisons centres whereas most patients are treated in general hospitals where there is limited access to specialised toxochemical laboratory facilities. Similarly, it can be argued that patients who agree to participate in research are not representative of the whole population of opioid overdose patients. Blinding of treatments is extremely difficult because patients are often in the emergency department for such a short period before they are discharged that the clinician who administers the treatment is usually the one who has to review the response to that treatment. The research undertaken so far has relied heavily on observational studies, which have a number of well recognised limitations, such as difficulty in minimising confounding factors and retrospective data collection. Studies have often used different inclusion criteria in terms of degrees of sedation and respiratory rate as well as different thresholds for giving further doses of naloxone, which makes direct comparison of studies difficult. Follow up of patients is difficult; Smith et al70 managed to contact only 32% of the patients who had been discharged. Other studies compared the lists of patients discharged with ambulance service records and death certificates issued by the local coroners. They may have been lost to follow up if they had given misleading demographical details and after discharge were taken to another healthcare facility by private transport, or if they had died later and been given an alternative cause of death. In spite of these difficulties, a number of conclusions can be drawn but further trials are needed to validate them clinically in the emergency department and thus help clinicians walk the tightrope between over and under treating these patients. Clinical judgement and meticulous observation are required to successfully manage opioid intoxicated patients. Although the evidence base is sparse at present, the following algorithm has been devised to summarise the research in a way that is clinically useful. References have been included where relevant otherwise the recommendations are based on consensus derived from the clinical experience of Medical Toxicology Units in Europe, the USA, and Australia. Although recent studies have suggested that intranasal and nebulised naloxone may be useful alternatives to parenteral administration, the authors think that the evidence is not strong enough yet to add them to the algorithm; however, they could be easily included in the flowchart as further evidence becomes available. Opioid overdose is a challenging condition that requires a difficult balancing act between over and under treatment with naloxone. Chamberlain JM, Klein BL. A comprehensive review of naloxone for the emergency physician. Am J Emerg Med1994;12:650–60. Sporer KA. Acute heroin overdose. Ann Intern Med1999;130:584–9. Christenson J, Etherington J, Grafstein E, et al. Early discharge of patients with presumed opioid overdose: development of a clinical prediction rule. Acad Emerg Med2000;7:1110–18. Cherubin CE. The medical sequelae of narcotic addiction. Ann Intern Med1967;67:23–33. Larpin R, Vincent A, Perret C. Hospital morbidity and mortality of acute opiate intoxication. Presse Med1990;19:1403–6. Bateman DN, Bain M, Gorman D, et al. Changes in paracetamol, antidepressants and opioid poisoning in Scotland during the 1990s. QJM2003;96:125–32. Flanagan RJ, Rooney C. Recording acute poisoning deaths. Forensic Sci International2002;128:3–19. Sadove MS, Balagot RC, Hatano S, et al. Study of a narcotic antagonist – n-allyl-noroxymorphone. JAMA1963;183:666–8. Howland MA. Opioid antagonists. In: Goldfrank LR, Flomenbaum NE, Lewin NA, Hoffman RS, eds. Goldfrank’s Toxicological Emergencies. 5th ed. Appleton and Lange 1998. Melichar JK, Nutt DJ, Malizia AL. Naloxone displacement at opioid receptor sites measured in vivo in the human brain. Eur J Pharmacol2003;459:217–19. Allen SC. Problems with naloxone (letter). BMJ1975;3:434. Moore RA, Rumack BH, Conner CS, et al. Naloxone after narcotic poisoning. Am J Dis Child1980;134:156–8. Schneir AB, Vadeboncoeur TF, Offerman SR, et al. Massive OxyContin ingestion refractory to naloxone therapy. Ann Emerg Med2002;40:425–8. Waldron VD, Klimt CR, Seibel JE. Methadone overdose treated with naloxone infusion. JAMA1973;225:53. Bradberry JC, Raebel MA. Continuous infusion of naloxone in the treatment of narcotic overdose. Drug Intell Clin Pharm1981;15:945–50. Redfern N. Dihydrocodeine overdose treated with naloxone infusion. BMJ1983;287:751–2. Gourlay GK, Coulthard K. The role of naloxone infusions in the treatment of overdoses of long half-life narcotic agonists: application to nor-methadone. Brit J Clin Pharm1983;15:269–72. Lewis JM, Klein-Schwartz W, Benson BE, et al. Continuous naloxone infusion in pediatric narcotic overdose. AJDC1984;138:944–6. Tenenbein M. Continuous naloxone infusion for opiate poisoning in infancy. J Pediatr1984;105:645–8. Romac DR. Safety of prolonged, high-dose infusion of naloxone hydrochloride for severe methadone overdose. Clin Pharm1986;5:251–4. Hendra TJ, Gerrish SP, Forrest ARW. Fatal methadone overdose. BMJ1996;313:481–2. Sachdeva DK, Jolly BT. Tramadol overdose requiring prolonged opioid antagonism. Am J Emerg Med1997;15:217–18. Wikler A, Fraser HF, Isbell H. N-allylnormorphone: effects of single doses and precipitation of acute “abstinence syndromes” during addiction to morphine, methadone or heroin in man (post-addicts). J Pharmacol Exp Ther1953;109:8–20. Evans LEJ, Roscoe P, Swainson CP, et al. Treatment of drug overdosage with naloxone, a specific narcotic antagonist. Lancet1973;I:452–5. Buchwald A. Naloxone use: side effects may occur (letter). Ann Emerg Med1988;17:765. Popper C, Kelen GD, Cunningham G. Naloxone hazard in drug abuser. Lancet1989;8669:446. Gibbs J, Newson T, Williams J, et al. Naloxone hazard in infant of opioid abuser (letter). Lancet1989;8655:159. Gaddis G, Watson WA. Naloxone-associated patient violence: an overlooked toxicity? Ann Pharmacotherapy1992;26:196–7. Longnecker DE, Grazis PA, Eggers GWN. Naloxone for antagonism of morphine-induced respiratory depression. Anesth Analg1973;52:447–52. Cohen MR, Cohen RM, Pickar D, et al. Behavioural effects after high dose naloxone administered to normal volunteers (letter). Lancet1981;8255:1110. Evans JM, Hogg MIJ, Lunn JN, et al. Degree and duration of reversal by naloxone of effects of morphine in conscious subjects. BMJ1974;2:589–91. Berkowitz BA. The relationship of pharmacokinetics to pharmacological activity: morphine, methadone and naloxone. Clin Pharmacokinetics1976;1:219–30. Flacke JW, Flacke WE, Williams GD. Acute pulmonary edema following naloxone reversal of high-dose morphine anesthesia. Anesthesiology1977;47:376–8. Taff RH. Pulmonary edema following naloxone administration in a patient without heart disease. Anesthesiology1983;59:576–7. Prough DS, Roy R, Bumgarner J, et al. Acute pulmonary edema in healthy teenagers following conservative doses of intravenous naloxone. Anesthesiology1984;60:485–6. Partridge BL, Ward CF. Pulmonary edema following low-dose naloxone administration. Anesthesiology1986;65:709–10. Harrington LW. Acute pulmonary edema following use of naloxone: a case study. Crit Care Nurs1988;8:69–73. Wride SRN, Smith RER, Courtney PG. A fatal case of pulmonary oedema in a healthy young male following naloxone administration. Anaesth Intens Care1989;17:374–7. Brimacombe J, Archdeacon J, Newell S, et al. Two cases of naloxone-induced pulmonary oedema – possible use of phentolamine in management. Anaesth Intens Care1991;19:578–80. Schwartz JA, Koenigsberg MD. Naloxone-induced pulmonary edema. Ann Emerg Med1987;16:1294–6. Louria DB, Hensle T, Rose J. The major medical complications of heroin addiction. Ann Intern Med1967;67:1–22. Steinberg AD, Karliner JS. The clinical spectrum of heroin pulmonary edema. Arch Intern Med1968;122:122–7. Gopinathan K, Saroja D, Spears JR, et al. Hemodynamic studies in heroin induced acute pulmonary edema. Circulation1970;42 (supplement) :44. Duberstein JL, Kaufman DM. A clinical study of an epidemic of heroin intoxication and heroin-induced pulmonary edema. Am J Med1971;51:704–14. Fraser DW. Methadone overdose. JAMA1971;217:1387–9. Bogartz LJ, Miller WC. Pulmonary edema associated with propoxyphene intoxication. JAMA1971;215:259–62. Frand UI, Shim CS, Williams MH. Methadone-induced pulmonary edema. Ann Intern Med1972;76:975–9. Robin ED, Cross CE, Zelis R. Pulmonary edema. N Eng J Med1973;288:292–302. Lusk JA, Maloley PA. Morphine-induced pulmonary edema (letter). Am J Med1988;84:367–8. Dettmeyer R, Schmidt P, Musshoff F, et al. Pulmonary edema in fatal heroin overdose: immunohistological investigations with IgE, collagen IV and laminin – no increase of defects of alveolar-capillary membranes. Forensic Sci International2000;110:87–96. Allen T. No adverse reaction (letter). Ann Emerg Med1989;18:116. Mariani PJ. Seizure associated with low-dose naloxone (letter). Am J Emerg Med1989;7:127–8. Michaelis Michaelis LL, Clark TA, Dixon WM. Ventricular irritability associated with the use of naloxone hydrochloride. Ann Thorac Surg1974;18:608–14. Lawrence JR, Lee FR. Ventricular fibrillation after narcotic withdrawal (letter). Lancet1975;2:717. Andree RA. Sudden death following naloxone administration. Anesth Analg1980;59:782–4. Cuss FM, Colaco CB, Baron JH. Cardiac arrest after reversal of effects of opioids with naloxone. BMJ1984;288:363–4. Merigian KS. Cocaine-induced ventricular arrhythmias and rapid atrial fibrillation temporally related to naloxone administration. Am J Emerg Med1993;11:96–7. Labi M. Paroxysmal atrial fibrillation in heroin intoxication. Ann Intern Med1969;71:951–9. Tanaka GY. Hypertensive reaction to naloxone (letter). JAMA1974;228:25–6. Azar I, Turndorf H. Severe hypertension and multiple atrial premature contractions following naloxone administration. Anesth Analg1979;58:524–5. Estilo AE, Cottrell JE. Naloxone, hypertension, and ruptured cerebral aneurysm (letter). Anesthesiology1981;54:352. Ward S, Corall IM. Hypertension after naloxone (letter). Anaesthesia1983;83:1000–1. Levin ER, Sharp B, Drayer JIM, et al. Case report: severe hypertension induced by naloxone. Am J Med Sci1985;290:70–2. Mannelli M, Maggi M, De Feo ML, et al. Naloxone administration releases catecholamines (letter). N Engl J Med1983;308:645–6. Osterwalder JJ. Naloxone – for intoxications with intravenous heroin and heroin mixtures – harmless or hazardous? A prospective clinical study. J Toxicol Clin Toxicol1996;34:409–16. Gurll NJ, Reynolds DG, Vargish T, et al. Naloxone without transfusion prolongs survival and enhances cardiovascular function in hypovolaemic shock. J Pharmacol Exp Ther1982;220:621–4. Groeger JS, Inturrisi CE. High-dose naloxone: pharmacokinetics in patients in septic shock. Crit Care Med1987;15:751–6. Bracken MB, Shepard MJ, Collins WF, et al. A randomized, controlled trial of methylprednisolone or naloxone in the treatment of acute spinal-cord injury. N Engl J Med1990;322:1405–11. Yealy DM, Paris PM, Kaplan RM, et al. The safety of prehospital naloxone administration by paramedics. Ann Emerg Med1990;19:902–5. Smith DA, Leake L, Loflin JR, et al. Is admission after intravenous heroin overdose necessary? Ann Emerg Med1992;21:1326–30. Osterwalder JJ. Patients intoxicated with heroin or heroin mixtures: how long should they be monitored? Eur J Emerg Med1995;2:97–101. Watson WA, Steele MT, Muelleman RL, et al. Opioid toxicity recurrence after an initial response to naloxone. J Toxicol Clin Toxicol1998;36:11–17. Vilke GM, Buchanan J, Dunford JV, et al. Are heroin overdose deaths related to patient release after prehospital treatment with naloxone? Prehosp Emerg Care1999;3:183–6. Goldfrank L, Weisman RS, Errick JK, et al. 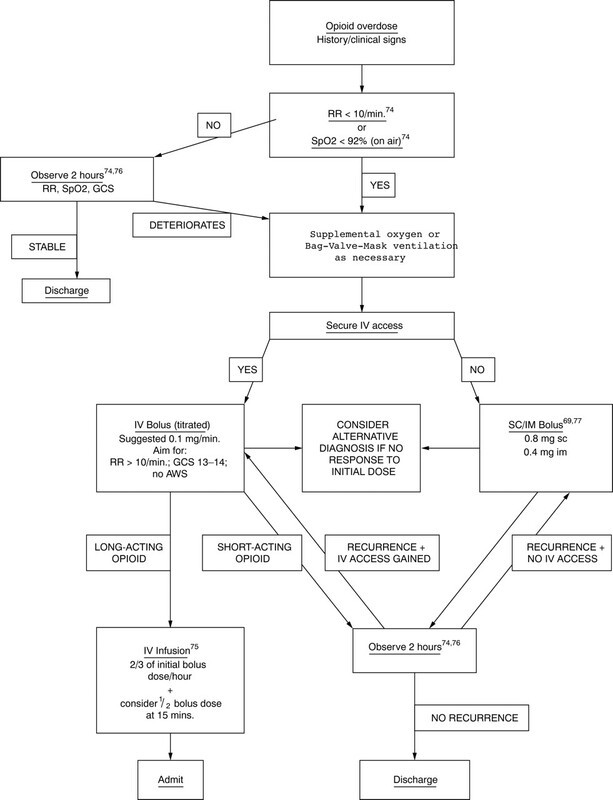 A dosing nomogram for continuous infusion intravenous naloxone. Ann Emerg Med1986;15:566–70. Sporer KA, Firestone J, Isaacs M. Out-of-hospital treatment of opioid overdoses in an urban setting. Acad Emerg Med1996;3:660–7. Wanger K, Brough L, Macmillan I, et al. Intravenous vs subcutaneous naloxone for out-of-hospital management of presumed opioid overdose. Acad Emerg Med1998;5:293–9. Chiang WK, Goldfrank LR. Substance withdrawal. Emerg Clin North Am1990;8:613–32. Barton ED, Ramos J, Colwell C, et al. Intranasal administration of naloxone by paramedics. Prehospital Emergency Care2002;6:54–8. Kelly A-M, Koutsogiannis Z. Intranasal naloxone for life threatening opioid toxicity (letter). Emerg Med J2002;19:375. Mycyk MB, Szyszko AL, Aks SE. Nebulized naloxone gently and effectively reverses methadone intoxication. J Emerg Med2003;24:185–7. Whyte IM, Buckley NA, Dawson AH. Data collection in clinical toxicology: are there too many variables. J Toxicol Clin Toxicol2002;40:223–30.